Combining computerised job scheduling with real time tracking and a series of mobile apps, PCS plan to use the cloud-based JobWatch system to replace existing software and paper-based systems. PCS has a team in excess of 120 engineers servicing mainly the bus and coach industry and the company is a ZF UK Service Partner and supports Cummins UK, providing diagnostics, servicing and repair and replacement services. The Wiltshire-based company also provide bespoke engineering support to bus and coach manufacturers such as Wrightbus and Alexander Dennis. PCS currently has 30 engineers equipped with tablets as part of a phased implementation that is expected to see a complete switch in the near future. JobWatch offers a wide range of apps to eliminate paper work sheets, time sheets and vehicle inspection reports. The mobile apps are all linked in real time to the BigChange back office management software that offers a management complete solution for tasks such as asset management, job scheduling and customer service. « BigChange will help play its part in supporting the business ». Most of PCS engineers are dedicated sub-contractors which made the BigChange solution very appealing to PCS. As a cloud-based system, PCS engineers can immediately access the JobWatch apps anywhere anytime using their own devices. Live tracking also means that the PCS office has full visibility of their movements including arrival and departure from site times. « With the apps we have real time and accurate information coming back and we can send jobs automatically to an engineer rather than having to call them ». 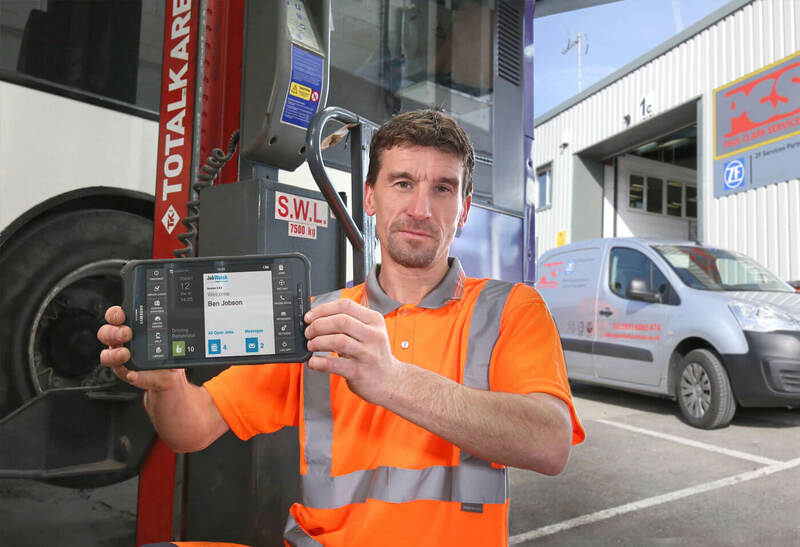 PCS engineers are using their devices for daily checks on their vans, eliminating paper reports. They can also capture time-stamped photographs that are linked to the inspection reports and can be used to record any incidents.